This Acoustic Audio Bluetooth 5.1 System features a contemporary design and is a stylish addition to any home. 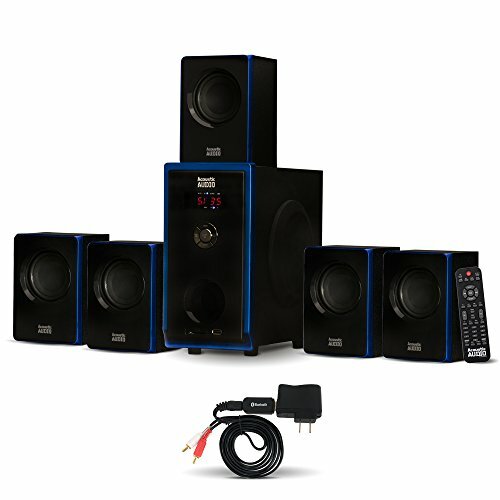 This 800 watt, 6-piece system includes one powered subwoofer and five satellite speakers as well as cables and instructions needed to "Plug and Play" any audio source with a RCA audio output or use the front panel USB interface or SD/MMC card input. Use it for your home theater system, personal computer or laptop, gaming system, cell phone, MP3 player or any other audio devices with 3.5mm headphone output. The powered subwoofer features independent speaker controls as well as bass, treble and volume functions. It utilizes a digitally tuned wooden enclosure for increased bass response. The full-range satellite speakers feature magnetic shielding for use near televisions and computer monitors as well as included mounting hardware.